The European ACP Women’s Rapid and Blitz Chess Championship 2018 took place from 29 March to 1 April in Tbilisi, Georgia. In total there were 78 players from 16 federations. The total prize fund of 20.500 EUR was shared between the rapid (14.500 EUR) and the blitz (6.000 EUR). 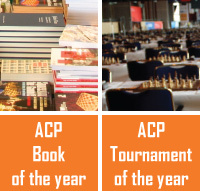 The ACP contributed with 5000 EUR to the prize fund, courtesy of the company Archibaldchess, and managed to secure conditions for 8 ACP Premiums. The rapid part of the event was won by our Premium Member IM Elizabeth Paehtz from Germany who had a better tie-break than several other Premium Members, all of them on 8/11: IM Anastasia Bodnaruk (silver), GM Anna Muzychuk (bronze), IM Anna Ushenina and GM Alexandra Kosteniuk. You can see the full standings here. The blitz part was won by our Premium GM Anna Muzychuk who scored 10/13. There was a three-way share for second place with 9.5 points with silver going to our Premium IM Elizabeth Paehtz and bronze to our Premium GM Monika Socko. Fourth place was taken by IM Anna Matnadze. The full standings can be found here.